This medicine may not be right for you. Read the label before purchase. Follow the directions for use. Incorrect use could be harmful. If symptoms persist, talk to your healthcare professional. 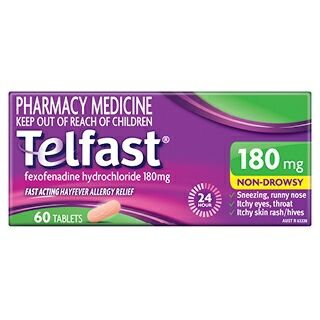 Telfast 180mg provides fast acting 24 hour relief of symptoms arising from Hayfever Allergy or Itchy Skin Rash/Hives. The tablets are sugar free, gluten free lactose free and non drowsy. If your online order is over $89 (including GST) we will ship your order free of charge. All Click & Collect orders are free of charge. For all other orders a $7.50 shipping fee will apply. Home delivery orders are shipped in plain packaging to protect your privacy.